This training tip is brought to you by Aryn Hervel of Novato, CA. 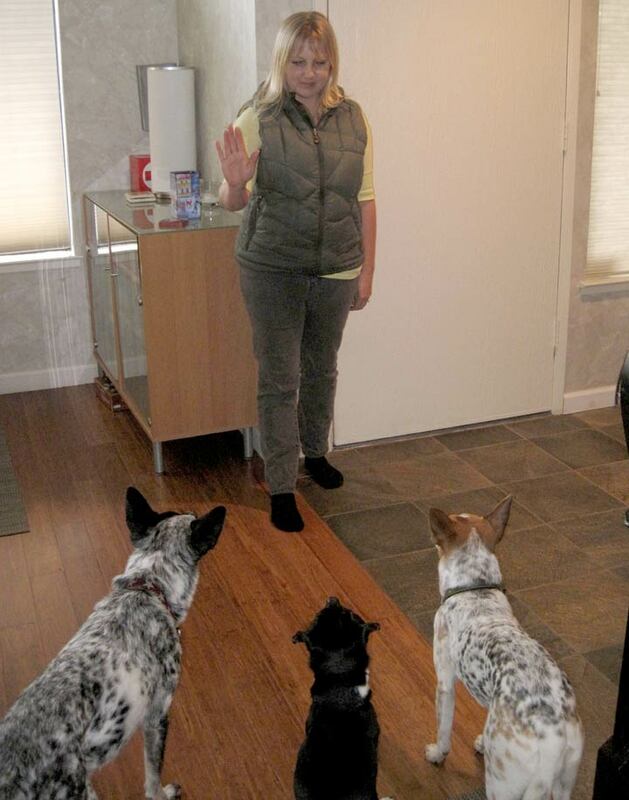 Aryn owns and runs Leaps & Hounds Dog Training, a behavior consulting and pet dog training business. Aryn and her All-American Dog, MACH4 Crush, are one of the top AKC Agility teams in the AKC Canine Partners program, having won the AKC Agility Invitational and qualifying and making the finals in many other national events. Crush also works as part of a team of scent detection dogs that locate wastewater leaks in northern California. We all love interacting with our dogs, but there are times when we need a little space. Whether your dog is excitable when you come home from work, breathing a little too close to your popcorn while you watch a movie, or getting in the way when greeting guests, it would be nice to have a way to tell your dog to give you a little personal space. 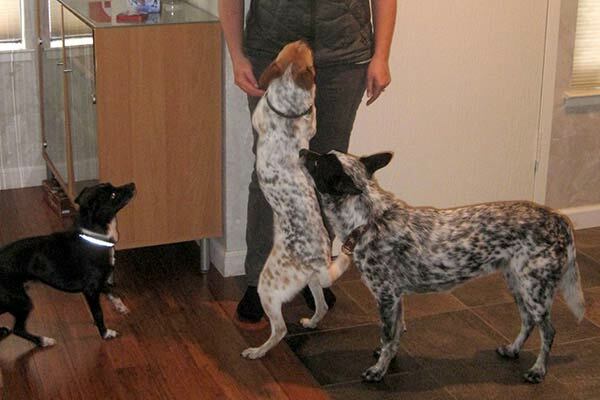 If you have multiple dogs, do the initial training with each dog individually. To start, I work in a narrow area like a hallway. All you will need are some small treats that are easy for the dog to find on the floor. Face your dog. Have a single treat enclosed in your left hand, with your left hand down at your side so your dog isn’t looking at it. 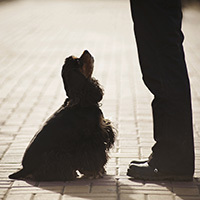 Raise your right hand in a flat palm facing the dog and move it towards the dog (as though you were signaling a person to back up their car) just after he sees your hand signal, step forward towards your dog just enough to cause the dog to move back. The moment the dog make any movement away from you, mark it by saying “good” and toss the treat behind your dog. After he collects the treat he’ll come back to you, when this happens repeat the first steps: hand signal, step towards him (gently, remember you’re only blocking his path, not bulldozing him) and when he moves back say “good” and toss the treat. Repeat until he is readily moving back when you raise your hand. After he has a good understanding of the behavior you can add a verbal cue. I use the word “back” for this, but if you already use that for something else, like Rally, be sure to use something unique here. And I’ll also add that you should make sure your hand signal is not the same one you use for your “stay” (I add movement to my hand signal so it is unique to this behavior). Still practicing in the hallway, with the dog in front or approaching you, say your verbal cue first and then offer your hand signal, when he backs, toss the treat. Repeat. Now that your dog has a basic understanding of “back,” you can add duration to it. Ask him to “back,” but this time require him to hold his position for a few seconds before rewarding. From there, slowly add more duration in small increments, a few seconds at a time. Once your dog is able to maintain some duration to his “back,” you can try this in new places and with new people. Some common areas are the front door, couch or kitchen. He may be confused about what to do in a new location (after all he hasn’t done this before), so be ready to help him out like you did when he first learned it. Start out at an easy level before making things harder. Lastly, you should begin to fade food rewards and instead use verbal praise while at a distance and physical interaction when in close proximity. This is especially important if you have multiple dogs, as you don’t want any competition over a treat on the floor. I hope this will allow you to have one more option for helping your dog to have excellent manners around household members and guests.